When processing honey, the moisture level is important to consider. For most beekeepers, we simply let the bees tell us when the moisture level is around 17-18%. This is when the bees cap off the comb to prevent the honey from absorbing any moisture. Some beekeepers get in too big of a hurry and take off the honey supers before the comb is completely sealed off. 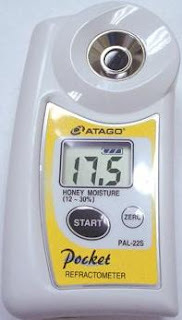 This means the honey can have a higher amount of moisture than 18%. Moisture above this level can cause some problems in the future, namely, allowing the honey to ferment. Of course, if you eat lots of honey, you'll consume it before it has a chance to ferment even when the moisture level is higher than it should be. But if customers buy it and keep it around for a while, then honey with a high moisture content can ferment. If you pull off your honey after it has been capped then you know the moisture level is good to go. However, if you pull off the honey supers that are partially capped, the uncapped cells will begin to absorb any moisture in the air. To safeguard my honey from drawing moisture while it is being processed, I monitor the humidity in my honey room. I keep it very dry by the use of a dehumidifier. I usually keep it around 45% in the room. If I cannot process my supers the same day I pull them off the hives, I will stack them in the honey room so that they are staggered. I leave the dehumidifier on maximum dry, and use a fan to circulate air in the room. Honey from different nectar sources can have different moisture contents. Clover honey is around 23% and is perfectly good honey with this level of moisture. However, other honey will ferment at 23%. In fact, moisture levels higher than 21%, other than the honey where this is permissible, is not fit for sale. Honey is hygroscopic which means it can easily absorb moisture from the air around it. But, if the air is dry, then honey will lose moisture, thus improving its quality. Some beekeepers use a refractormeter to check the moisture level in honey. We sell the Atago refractometer for $289. The easiest way to ensure your honey is at the optimal moisture level is to wait until the bees seal off the comb. Then, try to process your honey in a dry room and bottle it as soon as possible. Thanks for joining me today for another lesson in keeping bees. How do you know if your honey has fermented? Why is fermented honey a bad thing? can we store packed honey or honey in plastic drums in AC room? and what should be the humidity of room? This is my favorite honey! I enjoy it's creamy and smooth texture and delicate taste. Thank you for the interesting read! All these figures are variable.